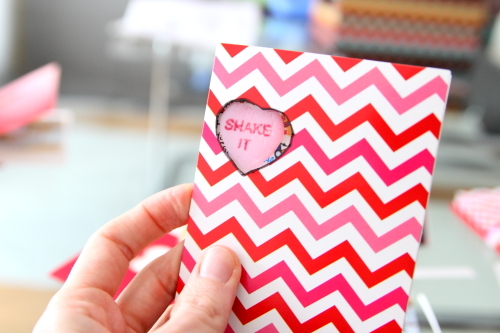 It’s been a while since I’ve done any DIY’ing (not sure that’s a word, but whatever), so I thought I’d give it a go. Truth be told, this was a project that I started a couple years ago (how’s that for intimidating–a DIY that takes 2 years to complete! 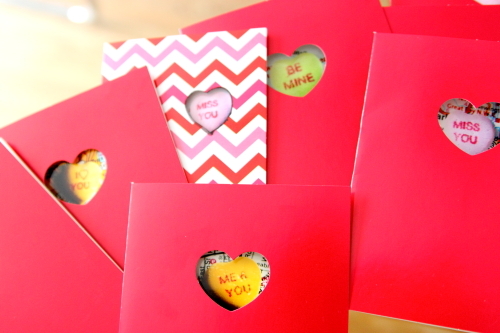 Yep–a couple hours of actual crafting and two years of procrastination). I actually just had the idea a couple years ago, took some starting pictures, and then got busy with things like moving to Buffalo, buying a home, and starting a family. Oops. And now, the play by play. 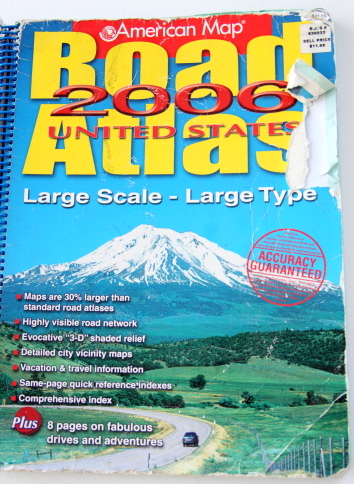 Start with some maps. 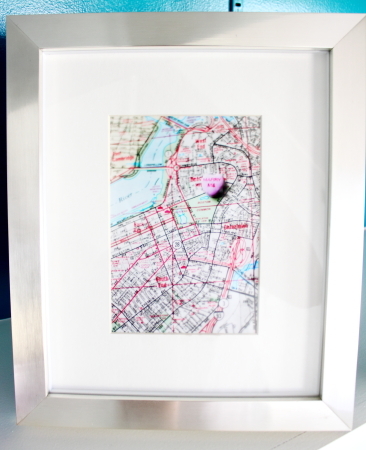 I used an old road atlas, but you could use any maps really–as long as they’re maps that mean something to you or someone you want to send the Valentine to. 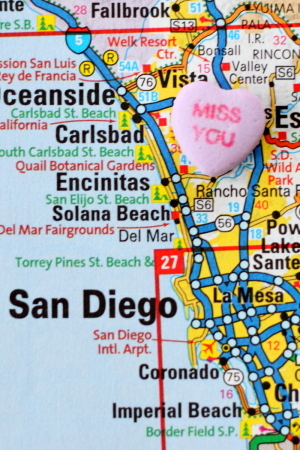 Then, get yourself some of those confectionery hearts. I got a pack of four boxes at the dollar store. On a sidenote, I think these things are absolutely disgusting–they taste like chalk. Is that just me? 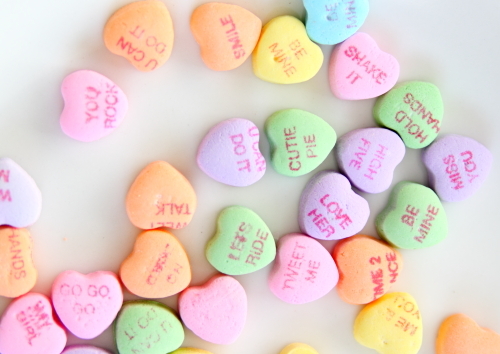 Personally, my favorite hearts are SweetTarts, but the sayings on those are too hard to read, so I went with these instead. Then, just pour them out and pick out any with good sayings (you’ll probably have to throw out half of them b/c the printing won’t be centered/legible/make sense/etc). 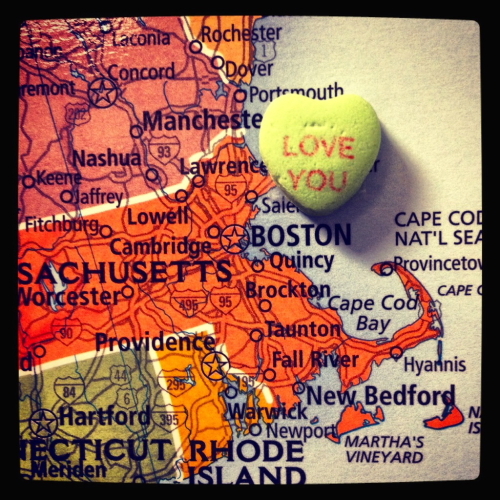 Once you pick out some good ones, just put the hearts next to a place with some meaning–I chose to place them near where the recipient lives, and snap a picture. Then, just print out the pictures. I ordered them online through Snapfish and picked them up an hour later at my local Walgreen’s. 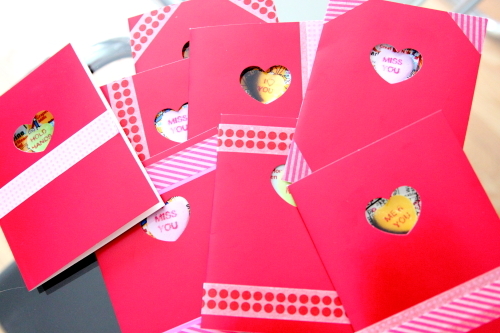 Not the best quality, but since these are just for Valentine’s cards and not destined for frames, I figured that was fine. 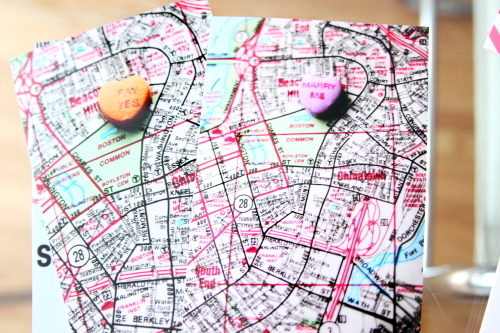 Once I got the pictures, I also grabbed some blank Valentine’s cards in the $1 section at Target. 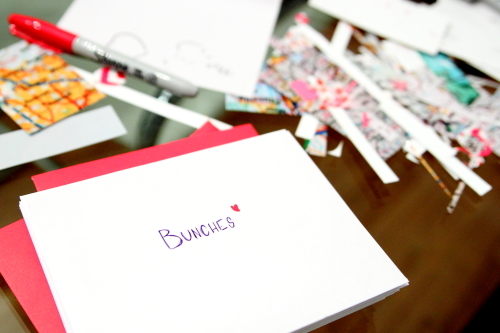 Pack of 8 cards & envelopes for $1? Yes please! 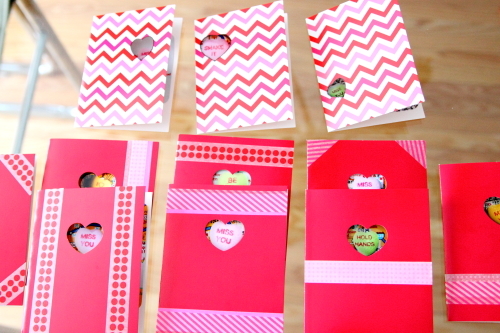 One pack had cut out hearts and the other were just plain chevron lovelies. 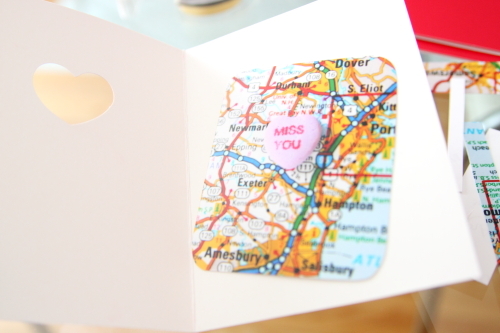 Then, I just cut down each picture to center the confectionery heart in the opening, and I gave the pics rounded corners just for a little something extra. 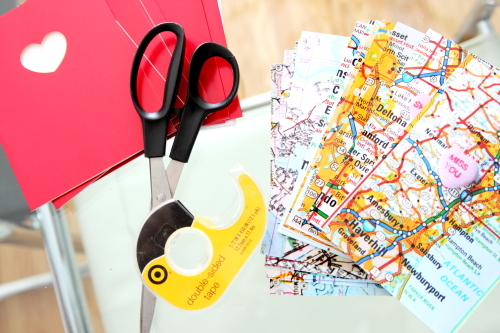 Once they were cut down, I added some double-side tape, made sure the pic was centered just so, and pressed. 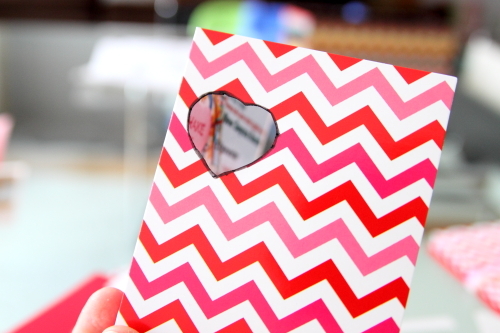 Now, some of my little hearts weren’t quite centered in the pictures I took, so those I put in the chevron cards. 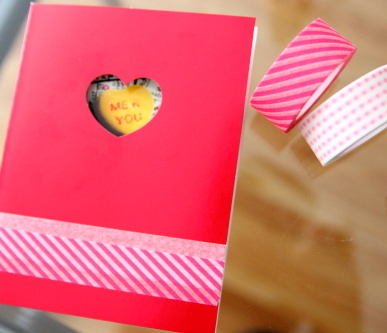 Which, of course, meant that I had to cut out hearts. Since my cutting job wasn’t stellar, I outlined it with a black sharpie. Black Sharpies–they hide all kinds of sins. And I could’ve stopped there, but well, I didn’t. I was craft-crazy and Mini B was taking an uncharacteristically long nap. So I embellished. 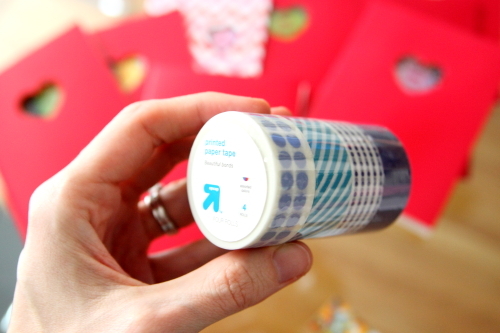 I got out my pseudo-washi tape (not real washi tape, but close enough–also from Target) and got my embellishing on. So much better right? 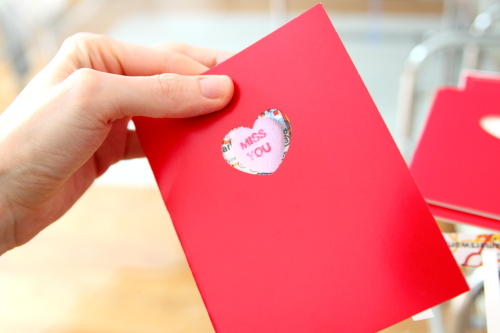 So there you have it–some easy DIY Valentine’s for your nearest and dearest. 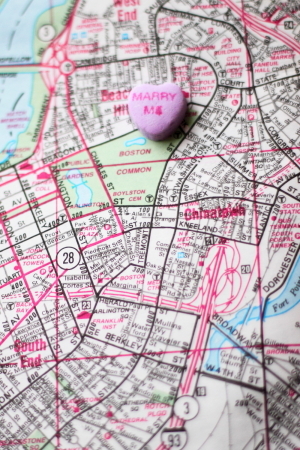 Oh, and this idea doesn’t just work for Valentine’s Day–I gave Mr. B a framed shot for our wedding anniversary last year (he proposed in Boston Common). And for those just waiting for Mini B to photo bomb this post, here you go. 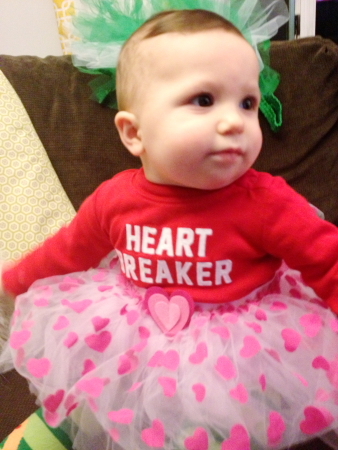 Quite the heart breaker this one, eh?